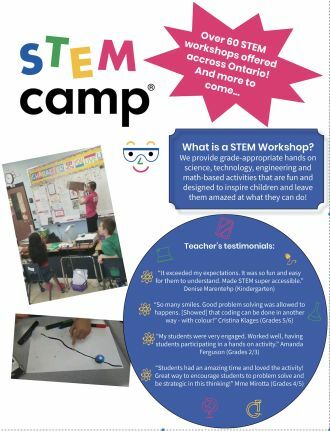 STEM Camp started a new initiative last month: STEM workshops in elementary schools (grades K through 6) in areas where STEM Camp operates across Ontario. The no-cost workshops consist of grade-appropriate, hands-on STEM activities designed to be super fun and to be educational at the same time. So far, STEM Camp has completed over sixty (60) workshops with 100% approval rating from the students and the teachers! Go STEM Camp! We started this initiative after a survey of seventeen hundred (1700) elementary teachers revealed that 83% said they could do more STEM learning in their classroom if they had our assistance. Therefore, we made the decision to pilot our in-school initiative in May and June of 2018. Ozobots (Robotics)​ - This is a basic level coding activity for students ages 4 to 11. Students use coloured marker to give “commands” to the ozobot for movement. This is hugely popular among all age groups and discussion points will involve critical thinking and problem solving skills. Each student will be able to use one ozobot. Bring Your Zombie To Life​ - a classic static electricity (physics) experiment that stands the test of time but now has a STEM Camp Zombie twist. This activity is geared toward 4,5 & 6 year olds who draw zombies on a piece of paper and then use the static electricity of a balloon to bring the zombie to life. Of course you can use it in your hair as well! It is a simple but effective way of teaching the concept by letting the students see what works and what doesn’t work. What happens when you don’t rub the balloon on your head, etc. The STEM hands-on activities would not only focus on technical skills, but also other essential skills such as problem-solving and collaboration. What happens when the experiment does not goes as expected? What do you do when you only have two hands but they are busy, and you need extra help? Teachers and the students all had fun together and learned about STEM. Who wouldn’t enjoy working with mini robots aka "Ozobots"? STEM is amazing and worthy to explore, regardless the age! It was interesting to note that many teachers were not aware that an estimated 90% of Canada’s future jobs require STEM education. However, they were pleased that with STEM Camp’s support, they could awaken their students’ curiosity about STEM. The workshops are taking place during the months of May and June, and we are receiving a large number of requests to continue them into the fall which we are exploring. What do you think about this new initiative? Would you like to have a STEM Camp workshop at your school?